1. Carson Wentz was held out of team drills for a third straight practice. Doug Pederson said afterward that he had seen enough of his rehabbing quarterback on Saturday and that limiting him since then was part of the medical staff's plan. Wentz told reporters that the Eagles wanted him in a "controlled environment." Pederson denied that Saturday's scare – Wentz was nearly sandwiched by two defensive linemen – had anything to do with the scale back. But Wentz said that staying out of harm's way had some influence on the decision. It sounds more plausible than the theory that he had suffered a setback. 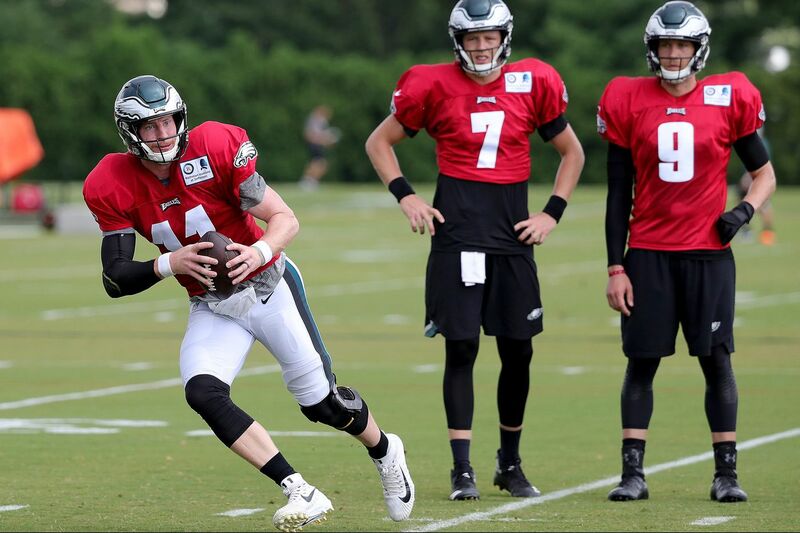 Wentz hasn't missed a minute of practice and he's done everything aside from team drills. The Eagles are understandably being cautious. Best case scenario, Wentz practices and plays in the preseason. But it isn't necessary, especially considering how he looked on Saturday. The Eagles still have a little over five weeks until the season opener. There is no hurry. 2. The rest of the injury report: Wide receiver Shelton Gibson suffered a concussion during Tuesday's workout and is in the protocol. He has shown that he has made some progress, but the injury will be a hindrance. Running back Matt Jones sat out with a "lower body" injury, per Pederson. He cut Tuesday short after getting hit during live drills. Tight end Adam Zaruba and cornerback D.J. Killings were absent from practice again. Their injuries are unknown. Running back Josh Adams returned after being sidelined a day. Receiver Alshon Jeffery, defensive end Brandon Graham, defensive tackle Tim Jernigan, safety Chris Maragos and receiver Bryce Treggs are all still out. 3. Practice was lighter a day after there were periods with tackling. The players wore shoulder pads, but were in shorts. Wentz was sharp during passing drills. He connected with tight end Dallas Goedert on a skinny post and hit tight end Billy Brown on a go route. Brown did a nice job adjusting his route after he turned back for the ball. Wentz would have connected with receiver Markus Wheaton on a stick route had safety Jeremy Reaves not grab him by the jersey. Reaves, an undrafted rookie, struggled during this set. He hasn't exactly stood out in camp. I wrote about him in May during rookie camp thinking that he may have a shot to make the team or even compete for the third safety spot. It's too early to rule Reaves out. But he's been running almost exclusively on the third team defense and has had issues in man coverage situations. Tight end Richard Rodgers toasted him on the last pass and Reaves, clearly frustrated, have a brief chat with safeties coach Tim Hauck afterward. Eagles’ tackle Matt Pryor walks off the field after training camp on Wednesday. 4. If you've wonder why I haven't written about 7-on-7 drills the last several posts it's because I've spent my time watching one-on-one drills between the defensive and offensive lines during that period. The starters typically take just one or two repetitions, while the younger guys bang on each other a bunch of times. Matt Pryor, once again, was a standout. He blocked defensive tackle Aziz Shittu to the ground on his first rep, squared up Winston Craig with ease, bumped out to tackle and wasn't fooled by a Joe Ostman spin move, and again squashed Shittu to the turf like an ant. Defensive tackle Bruce Hector penetrated past Isaac Seumalo, but the center had a strong rep vs. defensive tackle Fletcher Cox. The center hasn't exactly had a strong camp, but I think he's guaranteed a roster spot. The Eagles still love his potential. Jordan Mailata had his best day. The tackle did a better job of cutting off end Josh Sweat on his outside speed rush. But he whiffed on a Danny Ezechukwu spin move. Undrafted rookie tackle Toby Weathersby anchored well against a Steven Means bull rush and he stood his ground against Chris Long. 5. The Eagles spent most of team drills working on red zone and Goedert was a featured performer. Split wide opposite cornerback Sidney Jones, Goedert ran a corner route. Quarterback Nate Sudfeld's fade was a little off and behind his receiver, but Gordert ripped it down with one hand and ran into the end zone. A play later, Sudfeld hit Goedert in the back of the end zone on a post. The rookie got some snaps with the first unit later in practice. Quarterback Nick Foles went through his first few reads, but no one was open. He looked back to Goedert and he was still covered by Ronald Darby. But Foles threw high and the tight end muscled off the cornerback. Foles went back to Goedert when he got inside safety Rodney McLeod on another post. I'm certainly not the first to make this observation, but I can imagine many red zone plays this season in "12" or "13" personnel. The Eagles appear to have two tight ends capable of creating various mismatches inside the 20-yard line. 6. Rasul Douglas has had his moments, both good and bad, through the first week of camp. He was awarded some reps with the first unit on Wednesday. Foles threw over receiver Mack Hollins' head and right to Douglas. The interception was a gift, but I didn't see Douglas give up anything else during his brief promotion. He was very active during drills with the second and third units. Douglas offered run support and tackled Adams during one carry. He broke up a short pass to receiver Anthony Mahoungou. And he was glued to receiver Kamar Aiken when Sudfeld tried to squeeze a slant. The Eagles have five cornerbacks capable of starting, but Douglas will likely to have to wait his turn. 7. Here's a running diary of the first unit during team drills: De'Vante Bausby was back in the slot as he and Jones have ping-ponged days. Running back Corey Clement let a short Foles pass sail through his hands. Defensive end Michael Bennett beat tackle Lane Johnson and tapped running back Darren Sproles for a loss. Foles had receiver Mike Wallace open deep, but he went to Hollins on a dig and the ball sailed off high off the receiver's outstretched mitts. Sproles scored on an option pitch. Darby was all over receiver Nelson Agholor on an underneath route and notched a pass breakup. Foles had to throw out of the back of the end zone when safety Malcolm Jenkins– he had Agohlor on lock down – and company blanketed five receivers. Long read a naked bootleg and was credited with a sack. Goedert's score against McLeod came when the offense went hurry up on fourth down. Eagles’ cornerback Sidney Jones makes a one-handed catch during training camp on Wednesday. 8. The second unit: Sudfeld zipped a touchdown pass to Wheaton. Running back Donnel Pumphrey juked linebacker Joe Walker on a rush. He caught a screen pass a play later, but Walker was there to keep damage to a minimum. Sudfeld and Smallwood fumbled an exchange. Jones swatted a Sudfeld attempt to Aiken away. "I see you Sid," someone yelled from the sidelines. Smallwood broke free after tackle Halapoulivaati Vaitai blocked Sweat out of a gap. Sudfeld faked a pitch to his left, rolled right and found tight end Joshua Perkins ahead of corner Avonte Maddox in the end zone. Means had another sack. Smallwood took a screen down the sideline. Linebacker LaRoy Reynolds came in hard and had him lined up, but he didn't hit Smallwood square and bounced off as the tailback kept running. 9. And the third unit: Adams ran in for a touchdown when no one covered him in the flat. He ran over Craig on a north-to-south rush. It looked worse than it was – Craig was getting blocked back and was off balance. Pumphrey took a screen and burst into the next level. 10. And some leftovers … Kicker Jake Elliott hit two early field goals and was good on tries from 30, 45 and 34 yards. … Sproles and Agholor were the only two fielding kicks during special teams drills.